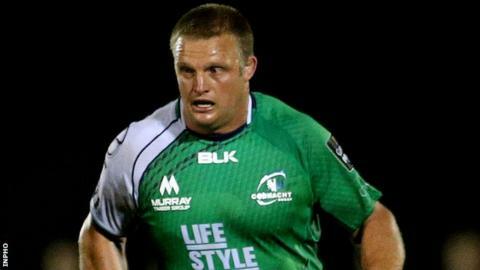 Ireland's injury crisis worsened on Wednesday when Connacht's tight-head prop Nathan White was ruled out for 16 weeks by an arm injury. With Mike Ross troubled by a groin strain and Marty Moore also injured, uncapped White had been in line to play against South Africa on 8 November. New Zealand-born White, 33, would have become Ireland's fourth oldest new cap. With White now ruled out, his Connacht team-mate Rodney Ah You and Munster's Stephen Archer appear next in line. Ulster's Declan Fitzpatrick could be another player in the thinking of Ireland coach Joe Schmidt although he has not played a great deal of rugby this season. On Wednesday, the Irish RFU said that Leinster star Ross was set to return to full training next week but his availability for the Springboks contest remains in some doubt. Former Chiefs Super Rugby player White sustained his injury in Ireland training and will undergo surgery next week. Tommy Bowe, Gordon D'Arcy and Stuart Olding joined Ireland's list of injury concerns following the weekend European action. Bowe and Olding both suffered concussion during Ulster's defeat by Toulon on Saturday while D'Arcy hobbled off during Leinster's win over Castres with a groin injury. Rob Kearney is also a doubt for Ireland's South Africa contest because of a hamstring injury while regular loose-head Cian Healy is already out of that game because of a similar ailment. Andrew Trimble, Luke Marshall, Iain Henderson and Donnacha Ryan will miss all Ireland's three autumn games while Leinster trio Fergus McFadden, Dave Kearney and Jordi Murphy are also currently out of action because of injury.